The Great Hanshin-Awaji Earthquake happened at 5:46 AM, January 17th, 1995. The disaster turned our world up-side down and left us feeling powerless and disappointed. Many of us felt useless without medical skills and unable to do physical labor. Three days later, the communication systems were recovered, and I had the opportunity to re-start my work with the people who know me from my previous flag artwork. Members of the international computer network BBS presented the idea "let's sell T-shirts in the U.S.A. to support the earthquake victims like the earthquake victims of L.A.". 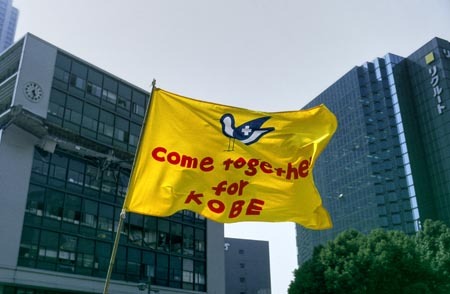 Everybody came up with the catch phrase "Come together for KOBE". I put a hurt seagull design with the phrase. The design grew to a charity T-shirt exhibition by 150 designers and artists. We had exhibitions at Kobe, Kyoto, and Tokyo, which gave many more people the chance to support the victims of the quake.